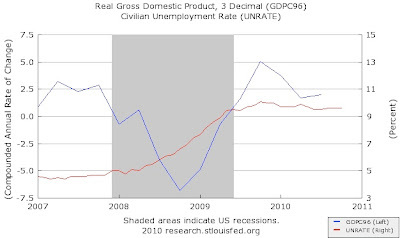 Also, the stimulus has lowered the unemployment rate by 0.8 to 2 percentage points - i.e., without it we'd be looking at 10.4% - 11.6%, instead of 9.6%. CBO estimates that the cost to the federal government of the TARP’s transactions (also referred to as the subsidy cost), including grants that have not been made yet for mortgage programs, will amount to $25 billion. That cost stems largely from assistance to American International Group (AIG), aid to the automotive industry, and grant programs aimed at avoiding mortgage foreclosures: CBO estimates a cost of $45 billion for providing those three types of assistance. Other transactions will, taken together, yield a net gain of $20 billion to the federal government, CBO estimates. It was not apparent when the TARP was created two years ago that the costs would be this low. Indeed. And I don't think its apparent to most people now that the costs were this low (which is a real problem, as I discussed in this previous post). 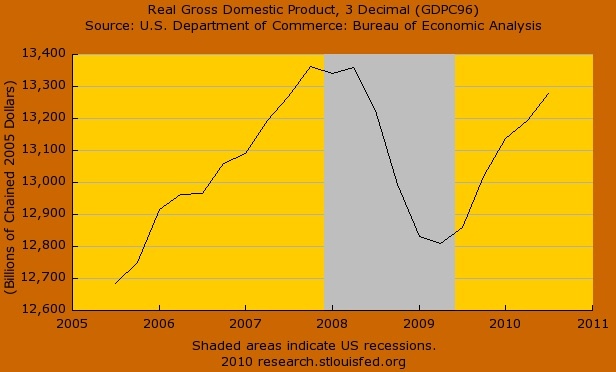 Real gross domestic product -- the output of goods and services produced by labor and property located in the United States -- increased at an annual rate of 2.5 percent in the third quarter of 2010, (that is, from the second quarter to the third quarter), according to the "second" estimate released bythe Bureau of Economic Analysis. Of the 2.5% growth, consumption accounted for 2%, investment for 1.5% (of which 1.3% was due to inventories), government purchases 0.8%, and net exports -1.8% (i.e., imports grew faster than exports). My Wesleyan colleague Richard Grossman has started a blog, Unsettled Account, which shares its title with his new book on the history of banking. Check it out! Punting down the River Cam in a flat-bottom boat is the classic way to see Cambridge, but mastering the long wooden pole takes practice. Book a 90-minute lesson with Scudamore’s Punting Company (Granta Place, Mill Lane; 44-1223-359750, scudamores.com), which will assign a well-muscled tutor to punt you down the gorgeous stretch of river that runs behind the colleges. Halfway through, the pole is handed to you, for a lesson in propelling the unwieldy craft. If you didn’t come to Cambridge for tutoring, rent a kayak from Scudamore’s and paddle to the Orchard Tea Garden (45-47 Mill Way, Grantchester; 44-1223-551125; orchard-grantchester.com), where E. M. Forster, Virginia Woolf, and Bertrand Russell hung out a century ago. Its a bit of a hike, but you can walk there (though it was beastly hot the day I did it - punting might have been better). 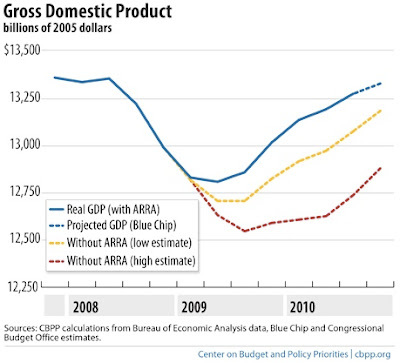 Every available piece of evidence seems to suggest that the Bush tax cuts did little to lift growth. Indeed, its fairly easy to demonstrate in simple economic models that higher marginal tax rates distort the economy and might lead to less labor effort and less saving (and hence a smaller capital stock). To be careful, though, in most models the effect of a tax reduction would be on the levels of income and output, not on the long run growth rate. I share his instinctive sympathy for this aspect of the Simpson-Bowles proposal (though I basically agree with Paul Krugman that the package is bad overall). However, as Leonhardt points out, as an empirical matter, its not clear that tax rates make that much of a difference to overall economic performance. The best decade for growth in the postwar period was the 1960's, when the top marginal income tax rate was over 70% (as I noted in the second-ever post here). The economy did well after the 1993 increase in the top marginal tax rates, and not particularly well after the 2001 and 03 rate cuts. Of course, that doesn't prove anything - the effect of any policy should to be judged relative to a counter-factual. That is, perhaps the economy would have done even better in the 1990's without the tax increase, and even worse in the 2000's without the tax cuts. Nonetheless, I think a brief glance at historical evidence is enough to convince us that lower marginal tax rates aren't some magical economic elixir. As an economist, I'll never say that people don't respond to incentives, but, in the case of taxes, it looks like they don't respond very much. In late April, fears of a serious European debt crisis began to emerge. These fears sparked a mild panic and a renewal in the flight to safety. This flight manifested itself, in part, as a rush to buy American government debt. Treasury yields had been rising in the months prior to the crisis, but plunged from April through the summer. The dollar shot up; the trade-weighted dollar rose nearly 5% from late April to early June. In response to the pressure within markets, the Fed reopened currency swap lines it had used in previous stages of the crisis. It did not, however, take steps to offset the impact of the financial hiccup on growth expectations. Markets reacted. The Dow fell over 13% from late April to early July, and was still 10% off its April peak in late August. From January to April, 10-year inflation expectations were stable at around 2%. 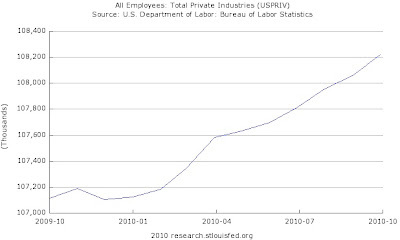 These began falling sharply, and were down to around 1.5% by the end of the summer. Every signal available began flashing a decline in economic expectations starting in late April. Let the economists gasp: The classical gold standard, the one that was in place from 1880 to 1914, is what the world needs now. In its utility, economy and elegance, there has never been a monetary system like it. I didn't gasp, I groaned. 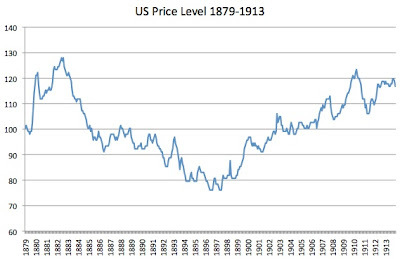 Here is a plot of the US price level from January 1879, when the US rejoined the gold standard after relying on paper "greenback" money during the Civil War, through December 1913 (the gold standard collapsed around the outbreak of World War I 1914), normalized to 100 at the beginning. Although the price level in the gold standard era lacked a long run trend, that doesn't mean it was stable. 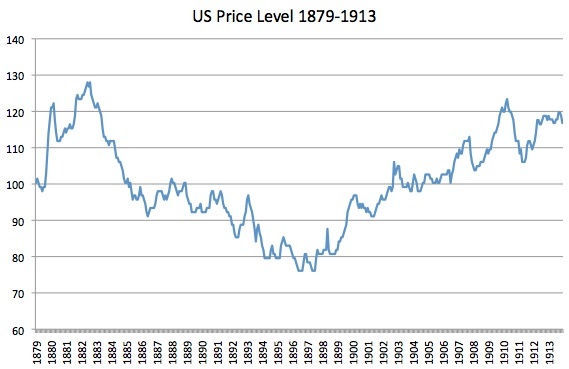 While the change in the price level from Jan. 1879 to Dec. 1913 was modest (average annual inflation of about 0.5%), there were significant runs of high inflation, and even more perniciously, deflation. Deflation raised the real value of debt burdens, which exacerbated the economic downturns of the time, which were frequent and severe (according to the NBER chronology, 189 out of 420 months were spent in recession). Moreover, financial crises were a regular occurrence; the severity of the 1907 "panic" helped motivate the founding of the Fed, which Grant so dislikes, in 1913. Its little wonder, then, that the gold standard was not universally liked at the time. The monetary system was one of the most bitterly contentious issues of the day, with the debate reaching its high point in the 1896 election, when William Jennings Bryan carried the south and west on a platform of freeing the US from the "cross of gold". There are plenty of reasons to criticize the Fed and its management of the modern "fiat money" system, but even with all of its mistakes, its doing far better than the gold standard. From the Washington Post's Neil Irwin, an interesting report on a conference sponsored by the Atlanta Fed commemorating the 100th anniversary of the conclave at Jekyll Island that laid some of the groundwork for the Fed's founding. "There's a sense out there that, quote, quantitative easing or asset purchases are some completely foreign, new, strange kind of thing and we have no idea what . . . is going to happen," Bernanke said, sitting onstage in a conference space that was once J.P. Morgan's indoor tennis court. "Quite the contrary - this is just monetary policy. . . . It will work or not work in much the same way that ordinary, more conventional, familiar monetary policy works." It is reassuring to have a Fed chairman who knows enough economic history that he's seen (or at least studied) it all before. The Ultimate Response to "the Chinese Professor"
That comes to my attention via James Fallows (see also his post on the original ad). The October employment report isn't really that good, but its soooo much better than what we've seen over the last few months... 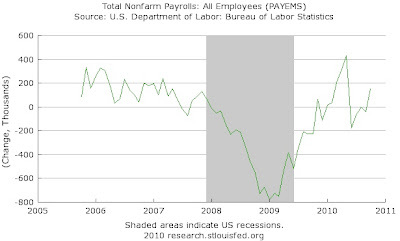 In particular, after falling for four consecutive months, nonfarm payroll employment rose by 151,000 in October. The June-September reports looked so bad partly because the government was shedding workers (some of them temporary census workers). Because of this, some observers (and the White House) preferred to focus on private-sector payrolls, which have increased every month since January, albeit at a faltering pace. 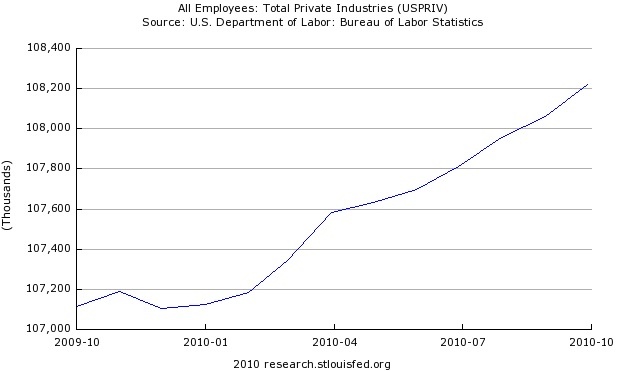 October's increase in private employment was 159,000, which was the best since April. Of course, with 14.8 million unemployed, that's not nearly good enough to make a dent. Essentially employment growth is back to a "treading water" pace, which only looks good after several months of drowning. That is consistent with the headline number from the household survey: the unemployment rate was unchanged at 9.6% in October. The underlying numbers aren't so hot - the number employed fell by 330,000 and the labor force participation rate fell from 64.7% to 64.5%. Indeed, given the recent pace of real GDP growth (1.7% in the second quarter; 2% in the third, according to the advance estimate), we're lucky the unemployment rate hasn't risen, as Okun's law - which says that unemployment rises when growth is below 3% - would imply. Note that October is a month where the seasonal adjustment is downward; on a non-seasonally adjusted basis, payrolls increased 919,000 (private payrolls increased 409,000), and the unemployment rate fell to 9% (from 9.2% in September). So, we have a “strong” jobs report — with total employment still 7 1/2 million less than it was three years ago, we had job gains slightly higher than the number needed to keep up with population growth. At this rate we’ll return to full employment around 2030 or so. That would represent a roughly 25% increase in Fed assets (currently about $2.3 trillion, including $838 billion of Treasuries); and a drop in the bucket relative to $8.6 trillion in US debt held by the public. Will it work? 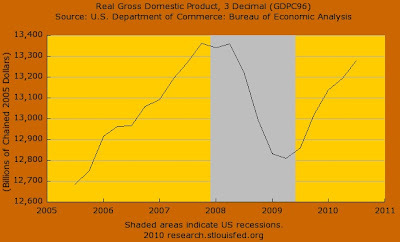 That has been the subject of considerable debate, which echoes an old-school Keynesian versus Monetarist scrap: Among the Keynesian skeptics are Paul Krugman and Mark Thoma and Joe Stiglitz, who would prefer more fiscal expansion. On the other hand, David Beckworth and Scott Sumner are more optimistic that QE can be effective. Also, a recent auction of TIPS (Treasury Inflation Protected Securities) suggests that inflation expectations are rising (see this NYT story, and this Jim Hamilton Econbrowser post). Mr. Hoenig believed the risks of additional securities purchases outweighed the benefits. Mr. Hoenig also was concerned that this continued high level of monetary accommodation increased the risks of future financial imbalances and, over time, would cause an increase in long-term inflation expectations that could destabilize the economy. That is similar to the view expressed by Martin Feldstein in this FT op-ed. Another worry, expressed by Ambrose Evans-Pritchard, is that QE will start "currency wars," to which I say, "bring it on" (see this previous post). More details on the policy are available from the New York Fed, which will implement it. Update: Economix has a more comprehensive set of links to views on QE. In his Times column, David Leonhardt explains how "dovish" monetary views have been vindicated. Real Time Economics rounds up reaction from "economists and others" (Mike Pence, really?!). In a Washington Post op-ed, Bernanke explains "What the Fed did and why." See also: Free Exchange, Gavyn Davies, Scott Sumner, James Hamilton.